‘Can guinea pigs eat oranges?’ Good question! In my interest to see what foods guinea pigs could eat, I started wondering about oranges. We have them occasionally but our kids aren’t too keen on them so they don’t often appear in the fruit bowl. However we occasionally have them and its worth a check to see if whether they can eat them. Looking around the webs, it was quite surprising to find that there was a lot of owners who said that they perfectly fine for them to eat. My first thoughts were that they were too acidic for guinea pigs to eat. They are but it doesn’t mean that they cant have them. Here are some things I picked up from researching into the issue. It is best to cut the orange into thin slices so that they are easy for the guinea pig to digest. As we know, oranges have a high amount of vitamin c so they will be very good for the guinea pig in that instance. Guinea pigs cant synthesise their own vitamin c, just like humans and so need regular supplements of it. Oranges as previously mentioned, are quite acidic which can hurt their intestines if they have too much. Just like they can hurt us if we eat too many. They have quite high sugar content, so again, too much wont do them any good. Can guinea pigs eat orange peel? Yes you can give them orange peel. If they will eat it, small amounts won’t do them much harm. 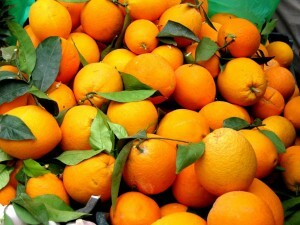 It does contain a lot of vitamin c but as with oranges, will hurt them if they have too much. Can guinea pigs have orange juice? No don’t give guinea pigs orange juice. It is much too sweet and sugary for them to drink.Their main drink should be fresh water. Can guinea pigs eat orange leaves? Yes, there is no reason why they cant if they are available and they like them. So can guinea pigs eat oranges? Yes, they can. But don’t give too much to them, a couple of slices a week should be fine for them. But anything more than that can give them tummy trouble. As far my guinea pigs are concerned, I’ll give them some orange if we have them around but I wont go the extra mile to buy them for him. They didn’t seem to like them that much! I tried to give my piggy a slice to see if she liked it, but she just took a sniff at it and ran to the other side of the cage. When I set it down on the floor of the cage to see if she would pick it up, she completely ignored it. Verdict: my piggy doesn’t like oranges. my guinea pig has no interest in oranges, but loooves the orange tree leaves! so much so they ate my mini orange tree… and i let them…. why??? I dropped an avocado pit and my piggy started nibbling at it. I would think it would help with its teeth, is this okay being its just a pit? I just tried giving my 3 Guinea pigs a bit of an orange. Two of them loved their slice, and the other was just taking little nibbles at it, so I’m not sure where she stands. I’ll definitely be feeding it to them again!